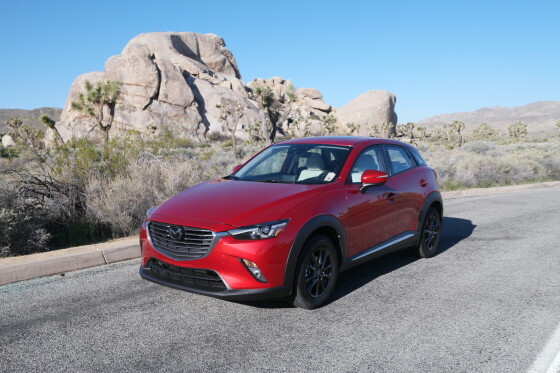 I have been on an adventure in Joshua Tree National Park as part of trip sponsored in part by Mazda. 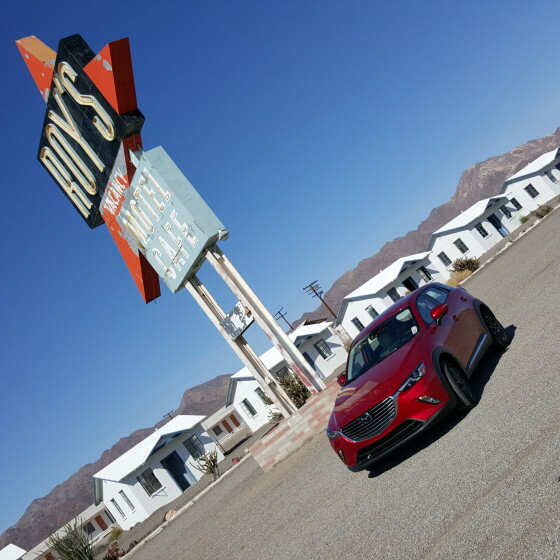 You can follow along with my adventure with the hashtag of #DrivingMatters. We were also sponsored by Napoleon Grills and Hormel Foods with Support from DriveShop and Men Who Blog. 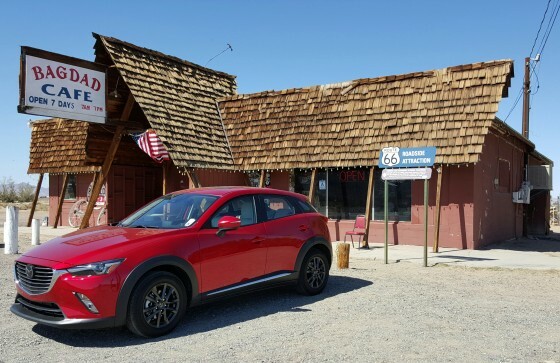 You can see my other adventurers over at the Mazda #DrivingMatters Exploring The Desert page. Despite waking up at an insane hour I was pretty awake during the ride today. I went back to sleep around 4am and woke up around 8am when people were awake and done with breakfast. They were ready to head out so it was lucky that I changed into clothes at 3am. I was able to jump right out of my sleeping bag to get going. I was paired up with Mike from The Gentleman Racer. We decided that we would go along the Route 66 track. I tried to capture all the places that we went through today’s vlog. and then after that through many photos of the locations we explored. 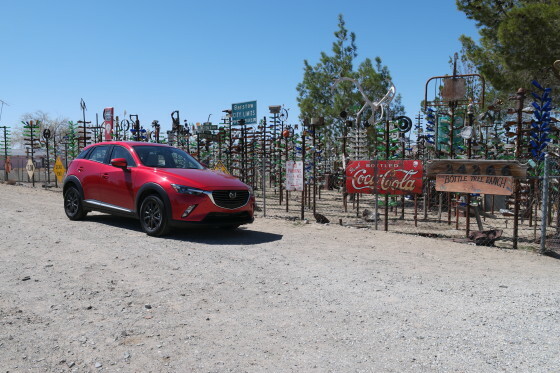 Along the way out of Joshua Tree we stopped a couple of times to take some photos of the Mazda CX-3 that we were driving. There are so many great things to see in Joshua Tree. We did wish that there were a couple of clouds to make the sky look more interesting but we had beautiful weather so why complain. Our first stop was at the Route 66 museum. Unfortunately. The place was closed so we were not able to go inside. We did take some time to take some photos around the outside of the building, though. 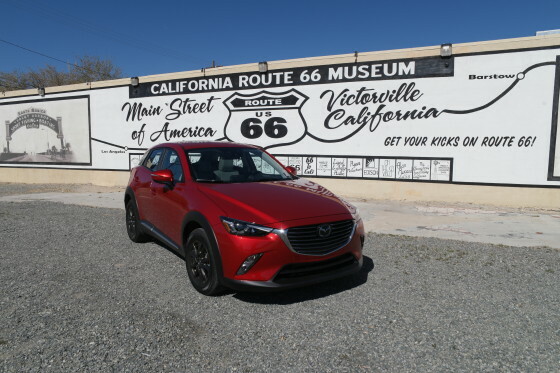 The giant mural on the side of the building was a great backdrop for the Mazda CX-3. We looked for many of those type of photos. After the Route 66 Museum we took a stop at Emma Jean’s Holland Burger Cafe. There I had a tasty Bacon Cheeseburger. 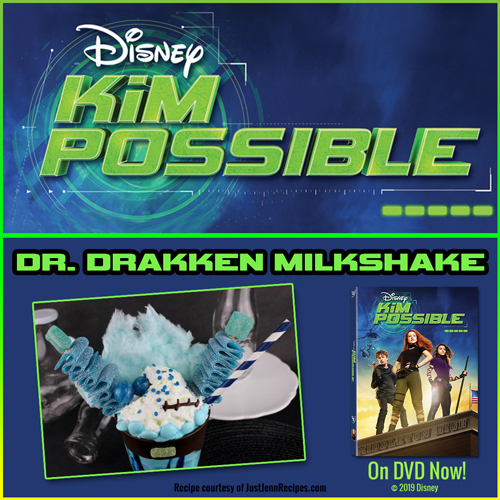 They have something call the Brian Burger. I should have gotten thr whole description before making my decision. I think that if I substituted the Swiss Cheese for American or Cheddar and I would have enjoyed that. We also went to The Harvey House or as it is also known Casa Del Desierto. This is a rail station in Barstow, CA, it also houses the Barstow Area Chamber of Commerce and Visitors Bureau, the Western America Railroad Museum and the Route 66 Mother Road Museum! After our trips to the locations of the Museum, Harvey House and Emma Jean’s we set off for The Bottle Ranch. 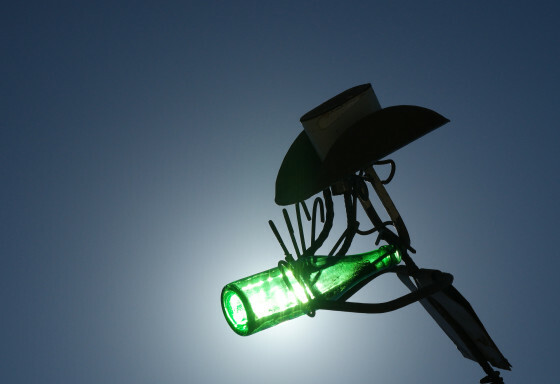 The Bottle Ranch was an amazing place, which you can see from my video above. This is a labor of love and a artistic calling of Elmer. 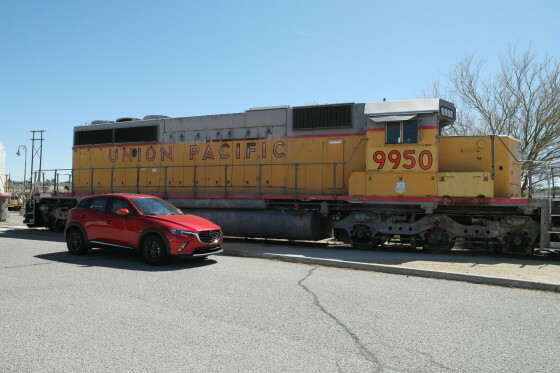 I did not get to meet him but some of the other #DrivingMatters travelers did. The Bottle Ranch was such a fun place to photograph. I got the one photo above for my photo-A-Day but many more of the unique items that were at the Bottle Ranch. Our next stop was at the Bagdad Cafe. This was the location for the movie of the same name, an 80’s movie that spurred the name change of the cafe. We did not go in but got some more photos of the car in front of the cafe. 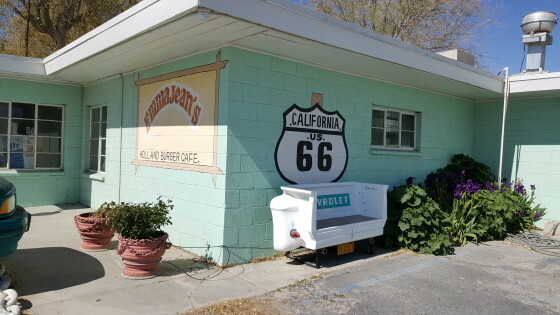 After our Bagdad Cafe stop we drove for a long while to get out to Amboy, California to see Roy’s Motel and Cafe. 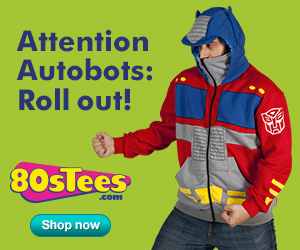 I can see the influence of this location on the movie, Cars. I don’t think that the motel is still running but the cafe is a working cafe. We stopped and got some water. Then we set up the camera and took a number of photos. Before we got to Roy’s there was one of those Route 66 signs painted on the road. We stopped before making our turn back towards Joshua Tree. While we were taking photos of the car and the sign there were a couple of girls from France also doing the same thing. We ran across them at the Bagdad Cafe as well. 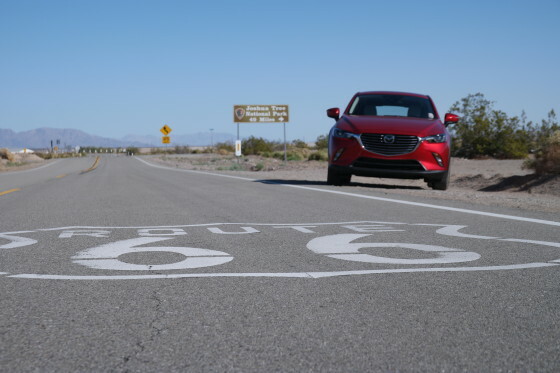 There are so many road trip stories along Route 66. 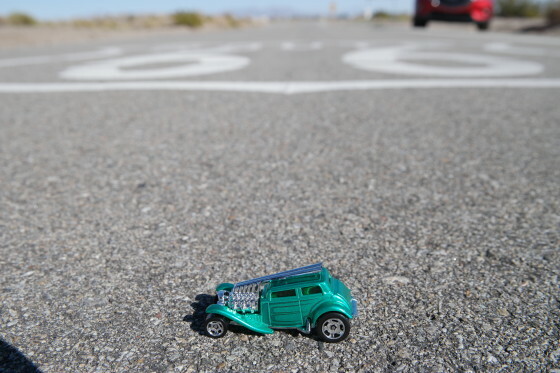 I also went and took photos of another one of the toy cars that I took with me on this trip. We got back to the campsite and while there we had a nice dinner and then hung around the campfire. We told stories about our collective days and had S’mores. 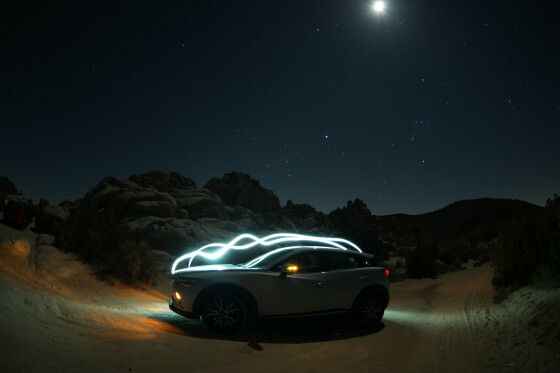 Then with James and Josh we made a whole bunch of special photos of the Mazda CX-3 by painting it with light while taking the long exposure shots.